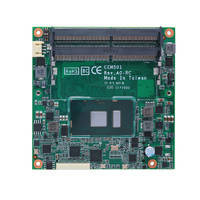 Form Factor Module is suitable for graphics-intensive applications. Powered by 7th generation Intel® Core™ i7/i5/i3 processor, CEM511 Compact Form Factor Module supports two DDR4-2133 SO-DIMM sockets with memory capacity of up to 32GB. Operated in temperature range of -40°C to +85°C, unit comes with six PCI Express lanes, three SATA-600 interfaces, one Gigabit LAN port, four USB 3.0 ports, eight USB 2.0 ports, and four digital I/O channels. Offering 12V DC-in wide range power input, product is compatible with Windows® 10 and Linux operating systems. Axiomtek - a world-renowned leader relentlessly devoted in the research, development and manufacture of series of innovative and reliable industrial computer products of high efficiency - is announcing the CEM511, a new COM Express Type 6 Compact form factor module powered by the latest 7th generation Intel® Core™ i7/i5/i3 processor (Kabylake-U) for high-performance applications. The palm-sized CEM511 is packed with a variety of rich features including low power consumption, industrial wide temperature range support and impressive graphic processing capability. The COM Express® Type 6 Compact module supports two DDR4-2133 SO-DIMM sockets with a maximum system memory capacity of up to 32GB. It has a rugged design with an extended operating temperature range from -40°C to +85°C (-40°F to +185°F) to satisfy different harsh environment demands. The system on module also delivers outstanding computing, graphics and media performance through its Intel® Gen 9 graphics engine, DirectX 12.0, OCL 2.0, OGL4.3 features and 4K resolution (4096 x 2160 @ 30 Hz) support. Therefore, the power efficient CEM511 is designed for graphics-intensive applications over the Industrial IoT, including industrial control system, medical imaging, digital signage, gaming machines, military, and networking. “The CEM511 a new industrial grade COM Express Type 6 module using the latest Intel® Core™ processor, is designed for the customer who is looking for a powerful, compact, flexible solution. The embedded board provides versatile features and benefits to reduce system development efforts and time, delivering the best solution for various embedded applications,” said Seamus Su, a product manager of EPDE PM Division at Axiomtek. The intel® Core™-based CEM511 comes with multiple I/O options including six PCI Express lanes, three SATA-600 interfaces, one Gigabit LAN port with Intel® i219LM controller, four USB 3.0 ports, eight USB 2.0 ports, and four digital I/O channels. Also, the LPC bus is available for easy connection of legacy I/O interfaces. With extremely low power consumption and 12V DC-in wide range power input, the CEM511 is designed for a semi-customizable integration and application-specific solutions. Trusted Platform Module (TPM 1.2) is also supported to provide efficient hardware-based data protection. This new low-power COM Express type 6 module runs well with Windows® 10 and Linux operating systems. It also supports AXView 2.0, an intelligent IIoT remote management software exclusively offered by Axiomtek. With over 25-year experience in design-in services and customized thermal solutions, the Company has been presenting a wide array of embedded systems along with software and modularized accessories to meet different levels of customized services. Axiomtek Technical Portal (ATP), a web-based support service, allows users to download up-to-date technical design guides, mechanical 2D/3D drawings, and software utilities simply through a click on the ATP web page. Axiomtek’s brand new application-ready CEM511 is expected to be available in mid-August. For more product information or pricing, please visit our global website at www.axiomtek.com or contact one of our sales representatives at info@axiomtek.com.tw.